This week, we have watched videos and read articles providing different aspects (pros and cons) of technology use. You may refer to any of these videos or articles in your essay, but you are not expected to directly quote from them. Talk about the ideas of the article by referring to the video and putting the ideas into your own words. 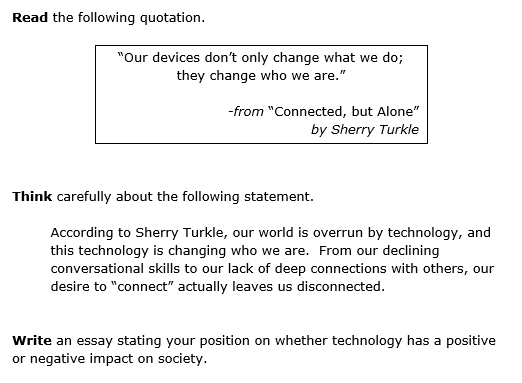 Use the “They Say/I Say” notes and the notes over each of the technology articles to help you. One of your body paragraphs should be dedicated to providing information from a video or article that we studied in class. One of your body paragraphs should share a personal example that proves your thesis. Your CONCLUDING PARAGRAPH should use one of the ideas from an article or video with which you disagree.